In addition, Hastings also announced plans to open a Netflix office in Mumbai. Here is everything he had to say in his first visit to India. 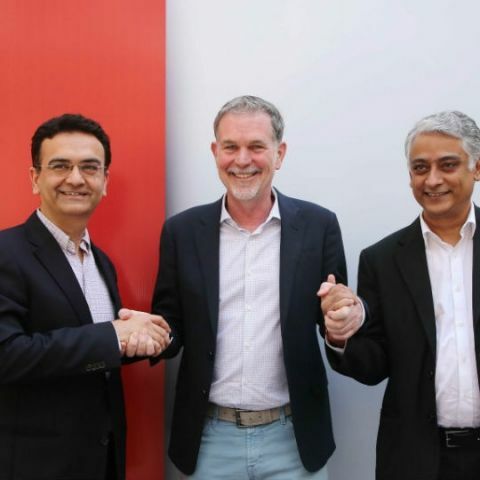 Netflix CEO and Co-founder, Reed Hastings is in India and in his first trip to the country, the head of the streaming giant announced strategic partnerships with Airtel, Videocon d2h and Vodafone. The strategic partnership with Airtel DTH and Videocon d2h will make Netflix content available to set top box users of the services. Bharti Airtel is expected to start rolling out these services starting March and will integrate the Netflix app on its direct-to-home service. Industry sources tell Digit that Airtel might be looking to launch a new internet-enabled set top box running on the Android operating system, which will house the Netflix app. However, Airtel has not officially revealed any such plans. “Airtel has been a pioneer in bringing the best of global content and products to its customers. We are delighted to partner Netflix to bring their popular content to our customer on one of our key digital platforms,” said, Gopal Vittal, Managing Director & CEO (India & South Asia), Bharti Airtel. “We are focussed on the set top box with them so that the device attached to the television has Netflix on it, so they can stream directly to the television. In case of Vodafone, it is a mobile partnership,” explained Hastings. When it comes to Vodafone, Netflix already has multiple global partnerships with the network operator. In India, the streaming service will integrate payments for subscriptions with the incumbent operator. Vodafone prepaid users will be able to pay for their Netflix subscriptions using their prepaid balance, said Hastings. Apart from announcing the above stated strategic partnerships, Hastings also spoke about optimising mobile streams to suit lower bandwidths. Hastings said, “At Mobile World Congress last week, we were announcing new video formats. So, it used to be that streaming to a mobile phone took 1.5 mbps. Over the years we reduced it to 1mbps, then .5 mbps, which is 500 kbps. We are now down to 200 kbps and we are working on 100 kbps.” Hastings hopes this will help ease video consumption on 4-5 inch screens. Addressing competition from other streaming services in India, Hastings said, “Here in India consumers are fortunate because there's a great battle with Hotstar, Amazon, YouTube and Netflix, and maybe others, all competing for consumer’s time. When you use your mobile phone, laptop, smart tv, there are many services to go to. You can do many things. We’re one of the choices. What’s unique about Netflix is that we have got these international originals, combined with local talent. We’re very happy to have partnered with Shahrukh Khan. His next 3 years of movies will be exclusive on Netflix.” Here, Hastings was quoting Netflix's recent licensing deal with Khan's production studio, Red Chillies Entertainment. According to Hastings, Netflix has seen strong growth in India. In fact, Netflix is also looking to open an India office in Mumbai, plans for which are currently underway. The company is expected to open doors to its India office somewhere around 2018.